Aristotle A. Esguerra has served in the Diocese of Madison since 2009 as music director at the churches of St. Mary, Pine Bluff and St. Ignatius, Mount Horeb, and as the chant instructor to the Cistercian Nuns of Valley of Our Lady Monastery, Prairie du Sac. To effectively defend the use of the liturgical languages of the Latin Rite in its mostly vernacular Ordinary-Form expressions, we must look to the Cross as found in the Gospel accounts of the Passion. We use these languages in the Latin-Rite liturgy not only because they have been handed down to us via the sacred tradition of the Rite but also—and most importantly—because we believe that Jesus Christ, the Second Person of the Holy Trinity entered human history, and that the historical reality of his Passion, Death, and Resurrection has eternal ramifications for every human soul. Use of Hebrew, Greek, and Latin in the Ordinary Form of the Latin Rite is not an outdated practice that points to the so-called Dark Ages. 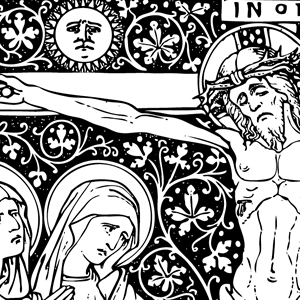 It is a liturgical, linguistic practice that points to the Cross of Eternal Salvation.